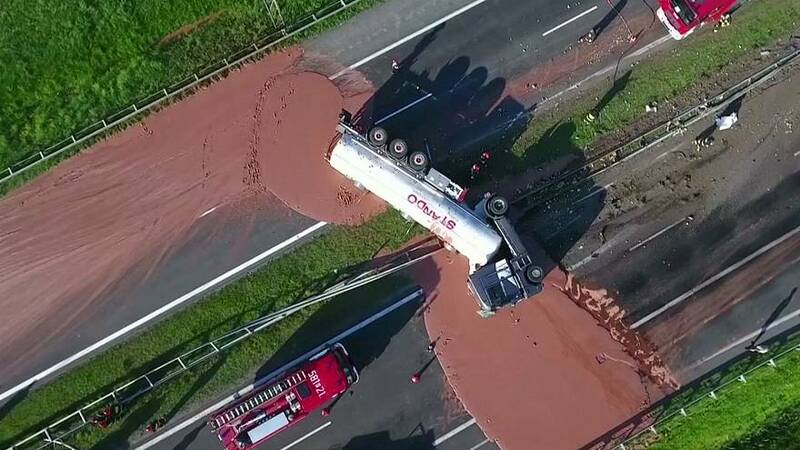 Polish drivers were left in a sticky situation after a lorry overturned and spilled its cargo of milk chocolate on Wednesday morning. The tanker crashed into a barrier on the A2 motorway and 24-tonnes of liquid chocolate streamed onto the road. The spillage, which happened near Graboszewo around 222 kilometres west of Warsaw, left firefighters scratching their heads. They said the chocolate had hardened on the road surface and was tougher than snow to remove. They even had to contact the manufacturer of the chocolate to try and find a solution for clearing it off the road. Eventually high pressure hot water was used to remove the spillage, which saw the motorway closed in both directions for several hours. In some areas, the chocolate was so thick that heavy machinery was brought in to scoop up the mess. The crash happened around 5.30am and the driver was taken to hospital with a broken arm, according to Radio Poland.